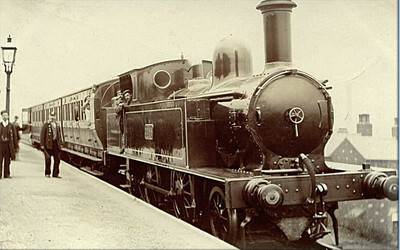 A lovely shot of a 4ft 6in 2-4-2T (No.2288) with 3 coaches in a station, but where is it? There is another photo of 2288 - also looking very new - at Batley station, Yorkshire. Might be a clue to the location of this beautiful photo? The mention of Batley suggests this might be the Birstall branch train at Carlinghow, where the line looks to have been on an embankment. Unfortunately the 1854 OS map does not make the position of the platform clear. It’s certainly a lovely photo and to me has a northern feel about it. Can anyone explain or identify the light patches on the walls in the background? Those regularly distributed paler patches on the gable-end and the back wall look like decorative stonework, though I can’t recall ever seeing anything like it before. There’s another odd thing - those two projections on the far side of the engine smokebox. They look like the ends of planks, presumably resting on the boiler handrail and on the tank top. Given the distance back to the cab, they might have been as long as fifteen feet, so maybe there was no other way to carry them. In the John Swift layout plans (Signalling Record Society) the platform at Carlinghow is shown on the east side of the line. If this is the same platform No 2288 would be headed towards Birstall. Hope this helps! If you walk 100 yrds up Carlinghow Hill and then turn 1st left on to Transvalle Terrace, then walk a further 30 yrds you reach the gateway to Batley Park on your left. Then go through the gate and proceed to walk 15 yrds on the path into the park. Now turn round and look back to where you came from and a fraction to the right is the view that the picture shows. The photo was taken from where you are then standing. I have the old waxseal, stamped deeds and land maps from when the station house was first built. These may be of some interest to some of your members. I am looking for a picture of the station house myself so if any body has one please could you contact me so that I can take a copy. If the mystery photograph is Carlinghow Station it would be great. I have a photo taken at the point suggested by Marc Wilson. The 'footpath' here is wide enough to have accommodated a platform. Further on the path is definitely single track! If this is where the station was then how was it accessed? Through the hospital car park maybe? I should have an old map of the area soon so will know better where the station is. The picture of Carlinghow isn't Carlinghow I'm afraid, as this station had wooden platforms. Also the houses shown in the background are terraced houses and none have a gable end as shown.